Elizabeth Arthur was born on November 15, 1953, the daughter of two writers, Robert Arthur and Joan Vaczek Arthur. Arthur and her parents lived in Yorktown Heights, New York until her parents divorced in 1959. In June of 1960 Arthur's mother married John Atlee Kouwenhoven, a Professor of English and an American Studies scholar, and Arthur lived with her mother and stepfather in Pleasantville, New York until 1967, at which time her mother and stepfather moved to Rupert, Vermont. From 1967-1968 Arthur attended the Oakwood School in Poughkeepsie, New York, transferring to Concord Academy in Concord, Massachusetts in the fall of 1968. In May of 1969, Arthur's father died. In the summer of 1970 she became a volunteer with the Student Conservation Association, working at Mount Rainier in the state of Washington, and in the winter of 1971, she attended an Outward Bound course run out of Dartmouth College into the White Mountains. Arthur graduated from Concord Academy in June of 1971, and in the autumn of 1971 began to attend the University of Michigan, her father's alma mater. In 1973, she dropped out of college and moved to Lander Wyoming, to teach at the National Outdoor Leadership School. At NOLS, Arthur met her first husband, Robert Gathercole, whom she married in Seattle, Washington on May 2, 1974, shortly afterwards emigrating to British Columbia, where Arthur and Gathercole lived until 1979. In British Columbia, Arthur and Gathercole bought a small island and built a house on it between 1974 and 1976. In the autumn of 1976, Arthur went back to college, to Notre Dame University of Nelson, British Columbia, which she attended from the autumn of 1977 until the college was closed down by the B.C. government in the summer of 1978. Arthur then transferred to the University of Victoria on Vancouver Island, and in 1978 received a B.A. in English with Distinction from Victoria. In 1979, she received a Diploma in Education. 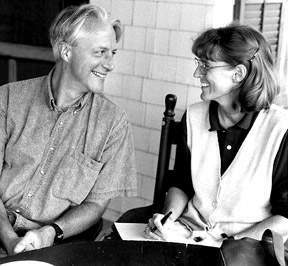 In that same year, 1979, Arthur and her first husband separated, and she moved back to Vermont, where, on the strength of her first memoir Island Sojourn, she was invited to be a Fellow at the Bread Loaf Writer's Conference in August of 1980. Arthur was divorced from Robert Gathercole in September of 1980, and on June 19, 1982 she married Steven Bauer, a fellow writer whom she had met at Bread Loaf. She and Bauer were married in Dorset Vermont, and then moved together to Ohio, soon buying a Victorian farmhouse in rural Indiana. Arthur was awarded a Fellowship in Prose from the National Endowment for the Arts for the year 1982-1983. Her first novel, Beyond the Mountain was published in 1983, with her novel Bad Guys following in 1986. During these years, Arthur also taught creative writing at the University of Cincinnati, from 1983-1984, and at Miami University from 1984-1985. In 1985 Arthur became a full time professor at Indiana University/ Purdue University of Indianapolis, where she was the Director of Creative Writing. In 1988 her novel Binding Spell was published, and in 1993, her second memoir, Looking for the Klondike Stone came out. In 1983 and 1987 she was a Staff Associate at the Bread Loaf Writer's Conference, and in 1989 she was awarded a Fellowship in Fiction from the National Endowment for the Arts. In 1992, Arthur became an Associate professor at IUPUI and was awarded tenure, and in 1993 her second memoir, Looking for the Klondike Stone was published. In 1994 she was on Senior Staff at Bread Loaf, and in 1996, after the publication of her novel Antarctic Navigation Arthur resigned from her position at IUPUI. Since that time has devoted herself full time to writing.